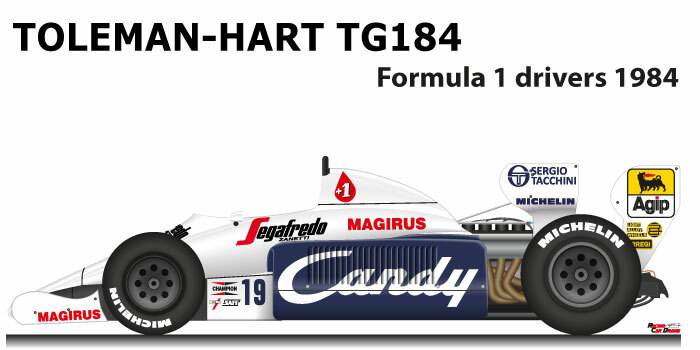 The Toleman – Hart TG184 n.19 is a car that participated in the Formula 1 World Championship in 1984. After years of poor results, in 1983 the Ted Toleman team obtained its first championship points, in 1984 it changed its drivers with Cecotto and promising young Ayrton Senna. The car was designed by Rory Byrne and Pat Symonds, and was equipped with a very reliable turbocharged Hart engine with high fuel consumption. Ayrton Senna with the Toleman – Hart TG184 n.19 came ninth in the Formula 1 World Championship in 1984. The Brazilian in the first season in Formula 1, amazed at his speed and especially for his wet driving in the Monaco Grand Prix in which started from the back of the grid, and won a fantastic second place behind the McLaren MP4/2 driver Alain Prost.